The Blue Shadow Virus duology–composed of episodes 1.17, “Blue Shadow Virus,” and 1.18, “Mystery of a Thousand Moons”–is a taut adventure that puts our heroes in one of the more frightening life-and-death situations we’ve seen thus far, given that it revolves around them preventing an extremely deadly airborne virus from spreading to Republic systems and wiping out billions of people. Yes, once again, Palpatine/Dooku/Separatists have cooked up a weapon aimed at the total annihilation of a population, in this case bringing back a virus capable of wiping out all life that had been eradicated long ago, but this time making it stronger, more resilient, and airborne. While our characters’ ultimate success is a given–since we know that Anakin, Obi-Wan, Padme, the people of Naboo, etc. will live on due to later chapters in the saga and it seems too early in the story for Ahsoka to die, if she indeed does before Episode III–the show still manages to not only wring a great deal of suspense as to how, and in a manner that gives each of the characters a moment to shine. For example, right off the bat, Threepio gets to pose as a Separatist droid, in order to try to get information from a mostly-decapitated battle droid about the location of the secret base. What’s particularly interesting about how Clone Wars uses Threepio is that he seems to be gradually evolving along similar lines to how he evolves in the original trilogy–from a complete fussbudget who constantly complains and claims to not be good at telling stories to someone who becomes not only extremely helpful and resourceful but even a good storyteller–implying that he unfortunately lost this development due to his memory wipe at the end of the prequel trilogy, which is sad, but at the same time that the capacity for this sort of growth has always been within him and he will regain it. Meanwhile, carrying the fool/hero thread that the show has been exploring with Jar Jar in each of his appearances thus far, he seems to cause a great deal of trouble when he accidentally crushes the battle droid whilst trying to catch a blue fly just as the droid seems about to divulge information, but on the other hand, his focus on the fly actually helps Padme pinpoint where the base is, whereas the droid quite possibly could have lied. 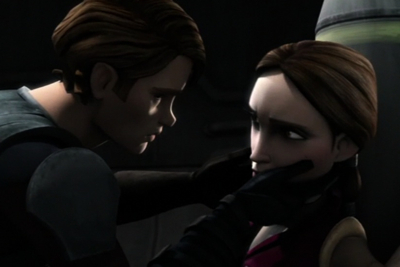 And although he and Padme are captured, they each continue to demonstrate great bravery both right before and during. Padme and Ahsoka, in particular, are remarkable throughout these episodes. Even though each one becomes infected in turn with the virus, for which they have no antidote, each one takes the news in stride and continues to fight, up to their last bit of strength, in order to ensure that none of the droids break out of the base and release the sickness to the outside population. Although not explicitly stated, I feel like Ahsoka’s stoic acceptance of her potential fate can be at least partially attributed to her recent experiences with Aayla, along with her own inborn propensity for worrying about others before herself. In fact, the person taking the situation least well is actually Anakin, whose worry for his Padawan and his secret wife exacerbate his usually tense nature. This leads to a great, small exchange between Obi-Wan and him in which he asks his Master how he manages to stay so calm in such a situation, and Obi-Wan tells him that he merely has learned to hide it better. Anakin, on the other hand, is practically jumping out of his skin the entire time. Because, again, he can’t let go of his emotional attachments. Obi-Wan warns him early on that they may have to let Padme and Jar Jar die in order to save the rest of Naboo, and later that they might even have to sacrifice the entirety of Naboo if it meant saving billions outside of Naboo, but Anakin is unable to accept either scenario. When they finally arrive at the planet that has the antidote, he immediately goes into attack mode, destroying 18 battle droids without stopping to realize that they are unarmed and not attacking him. In fact, they’ve actually been reprogrammed by a young boy, Jaybo Hood, into being harmless workers. It says a great deal about the Jedi respect for life–both organic and robotic–that Obi-Wan is upset with Anakin for needlessly destroying these droids. 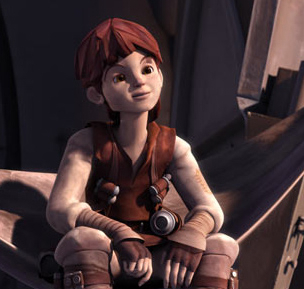 Anakin’s destruction of these droids–which look identical to the ones that fight them regularly but which nonetheless are no longer of that nature–calls to mind his slaughter of the Tuskan raiders in Episode II after they kidnapped and tortured his mother, leading to her death, just as the brilliant, precocious kid who figured out how to erase and rewrite their personalities is reminiscent of Anakin himself at that age (there’s even a potentially disturbing undercurrent to this kid’s talent for turning these droids into worshipful servants that calls to mind the Jedi Council’s concerns about young Annie). Later on, Anakin’s temper again nearly gets them into trouble, when he tries to zoom right through the energy field that no other ship has been able to withstand. If he hadn’t agreed to listen to Obi-Wan at the last moment, and instead retreat, they would have died. It’s only when he practices a modicum of patience, as Obi-Wan is constantly beseeching to do, and decides to use two of the boy’s droids to help decimate the generator that’s running the field that they are able to escape the trap (and I love that the destruction of the field looks like fireworks triumphantly bursting in the newly-freed planet’s sky). Symbolically, he has to get back in touch with that young, uncorrupted child he used to be in order to succeed. And while the ending is uplifting in the moment, putting it in the context of the larger saga, there is a level of high tragedy to the fact that it isn’t too relatively long from now when Anakin will lose his innocence all together, marked by the slaughter of young, inordinately gifted children, just as he once was and this boy now is.